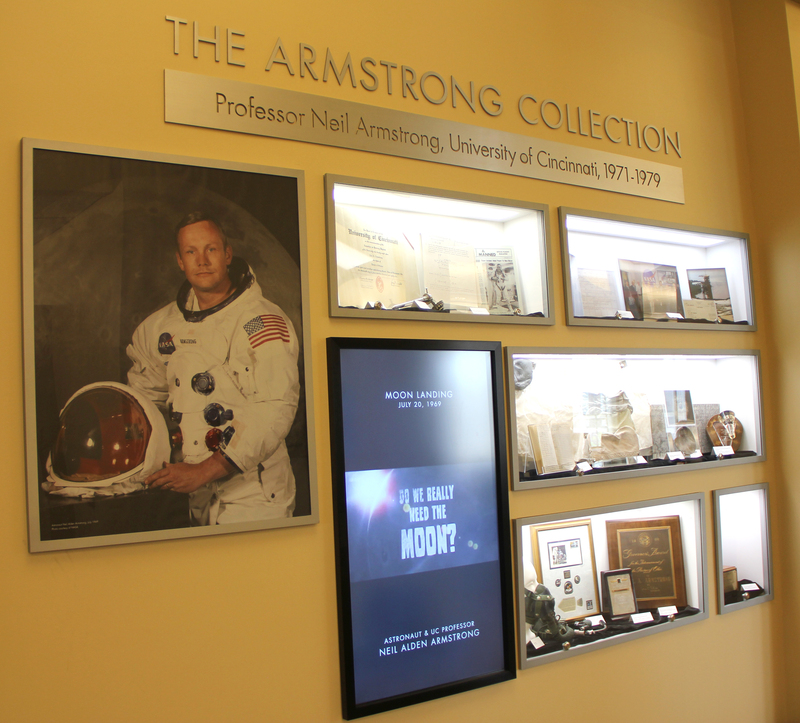 Thanks to support from the University of Cincinnati President’s office, we are pleased to announce a new permanent public exhibit recognizing Neil A. Armstrong and his time as a professor at the University of Cincinnati, 1971-1979. Located at the entrance of the College of Engineering and Applied Science Library, this exhibit brings together many objects and documents donated by the Armstrong family that are part of the University Archives housed in the Archives and Rare Books Library. The display represents many aspects of Mr. Armstrong’s life and accomplishments. Highlights are a flight mask and gear from his work as a test pilot (ca. 1960s), an encapsulated heat shield from the Gemini VIII mission (the first docking of two spacecraft in space), commemorations of the Apollo 11 mission and moon landing, Mr. Armstrong’s Honorary Doctor of Science degree conferred by the University of Cincinnati in 1982 and other awards. 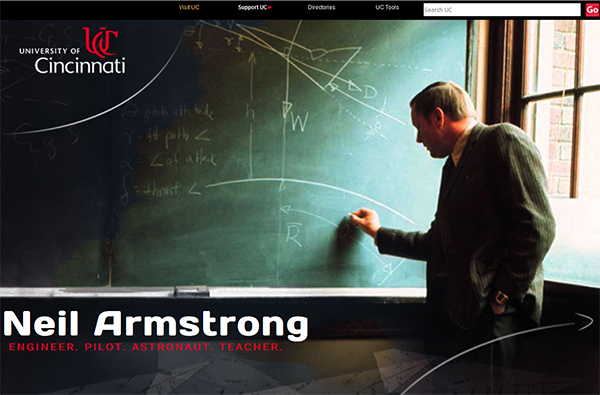 A touch display embedded in the exhibit allows visitors to interact with the updated Neil A. Armstrong commemorative website to learn more about Mr. Armstrong’s impact as a teacher and researcher and to browse many more archival items in digital form. The Neil A. Armstrong Commemorative Website and its accompanying Digital Archive have been enhanced and expanded with a significant amount of new digital content now available to a worldwide audience. Through partnerships with the Henry R. Winkler Center for the History of Health Professions (Henry J. Heimlich Archival Collection) and the Lloyd Library and Museum (George Rieveschl, Jr. Papers), the digital archive now contains a large number of documents and research materials related to Professor Armstrong’s involvement with UC’s “HARP” research group in the mid- to late 1970s. The HARP group, described in detail in this 2012 LiBLOG post, has an acronym that represents the last names of its prominent members: Henry Heimlich, Neil A. Armstrong, George Rieveschl and Edward Patrick. 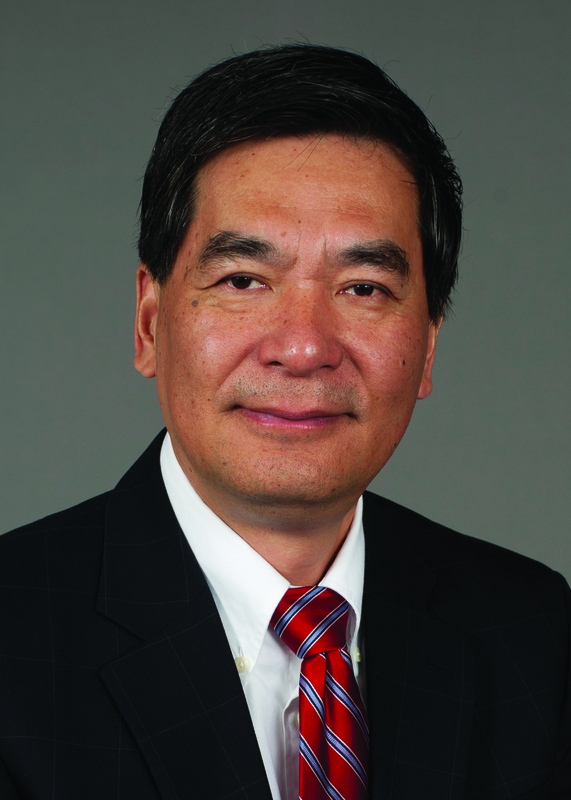 This think tank, also known as the Institute for Engineering and Medicine, garnered worldwide attention for developing a prototype of an improved heart-lung machine. New content in the Digital Archive includes research reports, laboratory experimental data and other documents on the pioneering research of the HARP group. Explore the full range of HARP research group documents in UC’s digital repository.